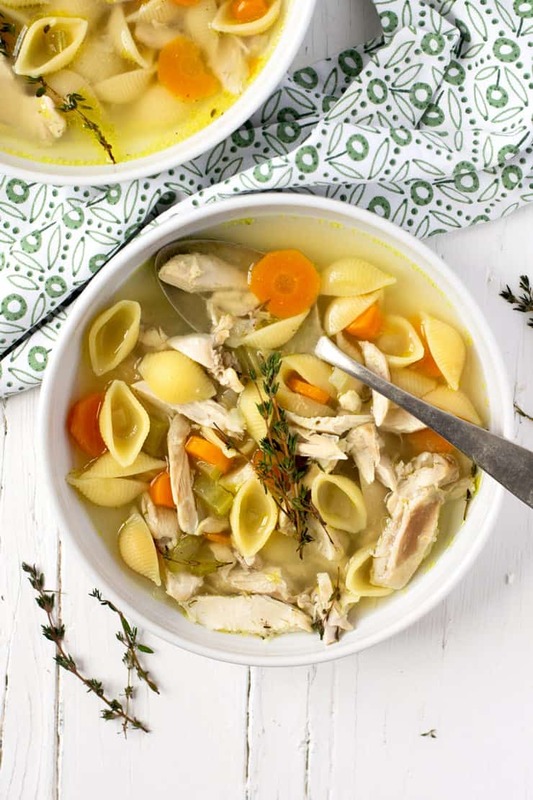 Easy, comforting Chicken Noodle Soup with tips for creamy & grain/gluten free versions. Plus, a recipe for delicious homemade chicken broth in the Crock Pot! This soup is pure comfort food and the perfect way to warm up and get cozy during the colder months. Is it just me or has this year’s stomach bug been making more rounds than usual? Somehow my family hasn’t been hit, but it seems like nearly everyone else we know has. For a while, my Facebook feed was overtaken with it. My friends were all taking turns nursing sick children or needing a nurse themselves. Ugh. 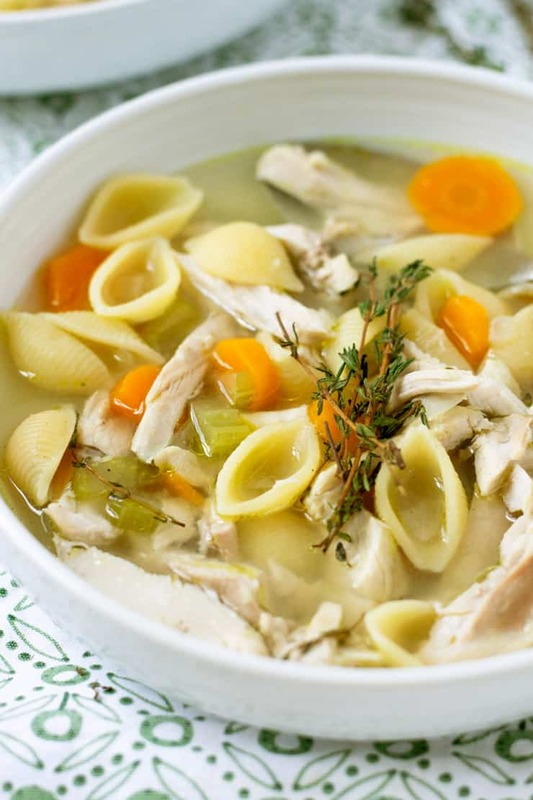 Well, sickness or none, this Classic Chicken Noodle Soup is so comforting and easy to make. It’s the stove top version of my Slow Cooker Chicken Noodle Soup. I do love the convenience of the Crock Pot when I’ll be away from the house and can’t cook dinner. But, when I’m home, I’m more inclined to cook this one on the stove since it takes under an hour and I think the flavor of is even better. Once you’ve had really good homemade chicken noodle soup, there is absolutely no desire to ever buy that little red and white can again. If you have a favorite homemade recipe, you know what I’m talking about. If you don’t, make this one and you will! 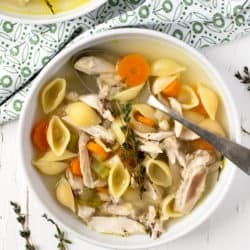 From-scratch chicken noodle soup, made with real chicken broth (we’ll get to that in a minute), has a richness that just can’t be found on the grocery shelves. The good news is it’s really simple to make. 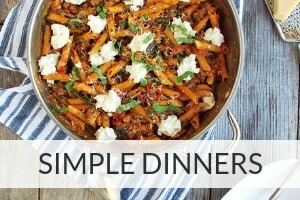 Literally, place all the ingredients except the pasta into a pot, cover, and let it simmer for a bit. Then remove the cooked chicken and chop on a cutting board. While you’re working on that, toss your pasta into the soup pot to cook. Return the chopped chicken, give it all a good stir and serve! Plus, it’s allergy friendly – it’s dairy free, soy free, nut free, egg free, and can easily be made grain and gluten free (see substitution notes below). It has been said that a soup is only as good as the broth used to cook it. I’d have to agree, but…can I confess something? I had never made my own broth until last year. For some reason, I envisioned a complex process that required all day in the kitchen. Just like the roasted vegetables thing, making chicken “bone broth” was way easier than I thought. I came across instructions for Slow Cooker Bone Broth about a year ago and couldn’t get over how simple it was! I hate even calling it a recipe because you literally put reserved chicken bones with a few other kitchen scraps and pantry staples a crock pot, let it do all the work, then strain it. Easy peasy. Homemade broth is effortless and nearly FREE, not to mention the nutritional benefits from the high concentration of minerals and amino acids. 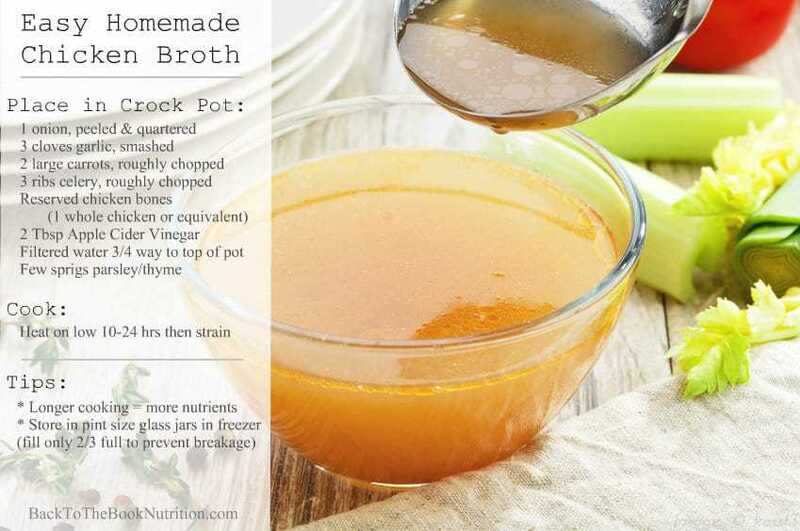 Read more about why bone broth is healthy, and how it differs from “stock” here. 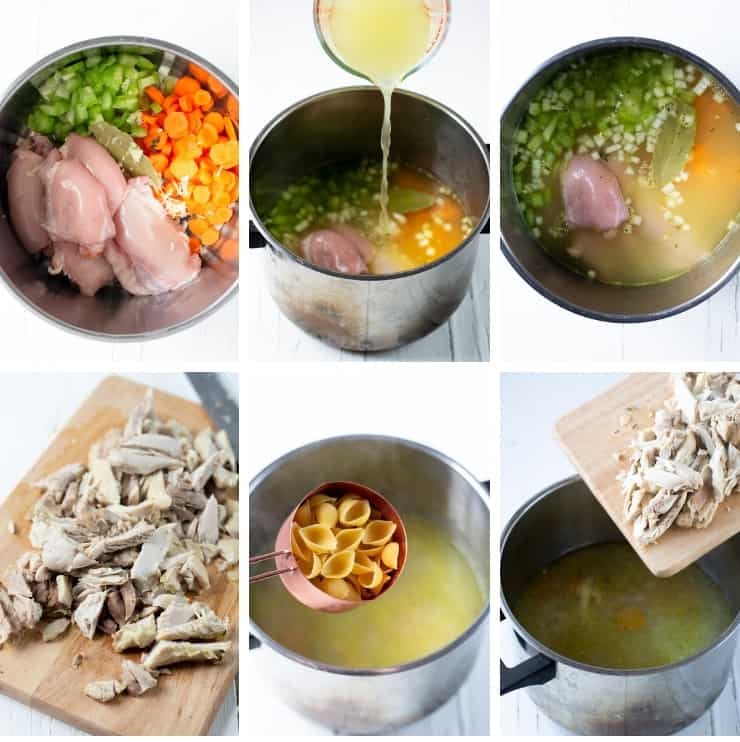 For Grain and Gluten Free Chicken Noodle Soup – Follow instructions, but substitute finely chopped potatoes (red, gold, or white) for the pasta, or try my gluten free 20 Minute Rotisserie Chicken and Rice Soup. For Creamy Chicken Noodle Soup – Add a few splashes of heavy cream at the very end of cooking. To Freeze – Follow instructions, but do not add pasta. Ladle soup into freezer safe containers. When ready to use, defrost and reheat soup. Cook pasta separately and stir in just before serving. I’d recommend also following this method for adding the potatoes if you’re freezing the grain and gluten free version. 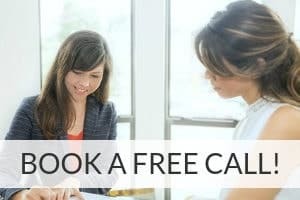 Bones & Other Ingredients – If I don’t have bones on hand from having just roasted a chicken, I use bones that I’ve gathered over time and stored in a gallon size Ziploc bag in the freezer. This “recipe” is very loose – as long as you have the bones, the other ingredients can be adapted based on your taste preferences or what produce you have sitting in your fridge at the time. Cooking – Bone broth can be made in as little as 10 hours or as much as 24 hours (The longer the time, the richer the flavor and nutrients). Some people cook it overnight while they’re sleeping, but I prefer to start mine early in the morning and cook until late at night so I’m not waking up to the smell of chicken broth. It’s a wonderfully rich, comfort food-type aroma, but not one I want to smell in the wee hours of the morning. Storing and Freezing – Once the broth has cooled slightly, I use a ladle or large funnel to transfer it to quart size glass storage jars , filling each only about half full since 2 cups is the most common amount of broth called for in recipes, and since the glass will break when the broth expands during freezing (spoken from experience). If I know I’m making a batch of this soup, which calls for just about the same amount that a single batch of broth yields, I’ll just transfer it to a single, half gallon glass storage jar in the fridge until I’m ready to use it. 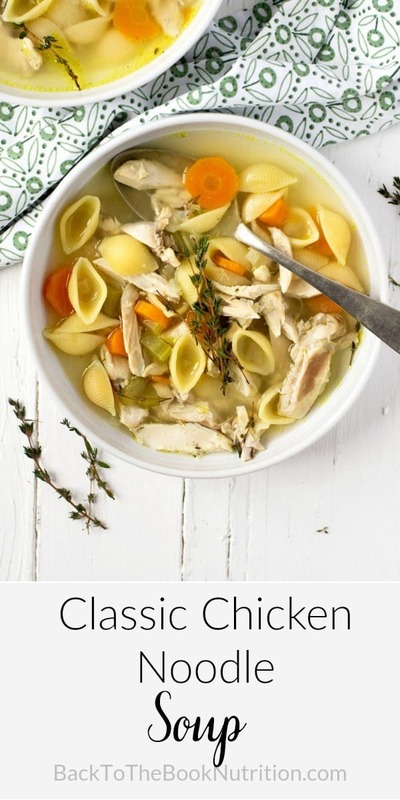 Old fashioned chicken noodle soup with simple steps for making it creamy or grain/gluten free. Place all ingredients except pasta in a large stock pot. Heat over medium high heat until liquid begins to bubble. Cover and simmer for about 30 minutes, or until a thermometer reads 165 degrees when inserted into the largest portion of chicken meat. Remove bay leaf and transfer chicken to cutting board. While chopping the chicken, Add the pasta (or potatoes) to the stock pot. Cook uncovered until pasta is done, about 10-15 minutes. Add chopped chicken and turn heat off. Garnish with fresh thyme (optional) and serve. For creamy version: Add a few splashes of cream at the end of cooking. For grain and gluten free version: Replace the pasta with an equal amount of chopped red, white, or gold potatoes. Cook as instructed above. I haven’t made broth since being in the States but I should! It would be easy and I could freeze it. Although it is hot here Dave and I eat a lot of soups! It is an easy meal and a really common thing for Asians to eat. So I’m going to have to try this recipe! Thanks for sharing it. Thanks, Beka! Yes, the broth and the soup are both incredibly easy! A warm bowl of chicken noodle soup is a nice one to have after all those sweet and fatty food we had over the holidays. I will make some today. My grandson is feeling a little under the weather so I know this is going to make him feel better. I hope he feels better, Kristine! This looks really good to have on a cold winter night. I haven’t made chicken noodle soup in quite a while so I guess it is about time that I did. I know my family will love your recipe. Nothing beats a good homemade chicken noodle soup! Especially on a rainy day. Chicken Noodle Soup is very popular in my area and especially at this time of the year when the weather is cold and grey. I like your recipe and photos. It all looks delicious. This is perfect for this cold weather, been craving for a hot soup these pass cold days, got to try this. Using really good, fresh homemade stock makes this soup come alive! I have never craved chicken noodle soup like I do now, and this has been the only recipe I have used! (Sometimes I use egg noodles instead of the pasta recommended, and I don’t deviate from the sea salt and fresh thyme in the recipe – both add great flavor.) Love it! I’m so glad you love the recipe, Deb! Egg noodles sound like a great variation!